Stephanie Hierholzer photographed clumps of oil, resembling pebbles, on the beach. "This is disaster that will impact the entire country"
(CNN) -- Stephanie Hierholzer returned to Grand Isle, Louisiana, on Wednesday to see firsthand what the Gulf oil spill is doing to the beaches where many childhood memories were made. 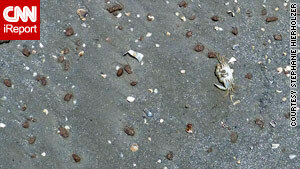 "It was heartbreaking" to watch "little clumps of oil" washing ashore and then melting into the sand under the heat of the sun, the New Orleans resident said. A massive flow of crude oil has surged into the Gulf of Mexico since an explosion on the Deepwater Horizon oil rig, barely 50 miles from Grand Isle, over the past five weeks. "My sister, mother and I have been crying for weeks because we know it's gone," Hierholzer said. "My nieces and nephews are never going to be able to go on the beach and do the things we did." Their family has spent every summer there since the sisters were babies, Hierholzer said. "I was fishing in the Gulf since before I can remember," she said. "Crabbing in the afternoon was practically mandatory." "It is where my children are learning the very same things," her sister, Melanie Fischmann, said. "Our fondest memories are of our life on the Gulf." As a barrier island, Grand Isle is a frequent target of major hurricanes. Fischmann said she always expected natural disasters were the threat. "Never in my wildest dreams did I think an oil leak gone awry would be the culprit," Fischmann said. "Mother Nature you can deal with, but this is horrifying and so very scary." Hurricane Katrina in 2005 covered the island with sea water and damaged or destroyed many homes and camps. "After Katrina, I thought we could survive anything," she said. "Obviously, I was wrong. We are not ignorant of the fact that our way of life is gone. I have tried to be optimistic, because that is what I was taught. We have always been resilient people, but it doesn't take a genius to know that all is lost." Compounding the frustration: Hierholzer has tried to volunteer to help with the cleanup, she said, but has had a hard time finding a group that wants her assistance. "I am angry! Absolutely outraged! I hoped Obama would be different," she said. "I can't believe the lack of respect shown to us. I blame BP, Obama and the administration for once again looking on the Gulf Coast as expendable." Hierholzer, a 41-year-old photographer, returned Thursday to take pictures of what she says is a dying beach. "If you see all those spots that look like pebbles, it's oil," she said. "I could see the high tide had brought in a slew of them, and they were melting in the hot sand. It was really disturbing." She said she is worried that people across the United States do no understand the importance of wetlands and barrier islands, such as those threatened by the spilling oil. "This is not just a loss for the Gulf Coast," she said. "This is disaster that will impact the entire country once our ecosystem is destroyed, which is only a matter of time."